Ideas sometimes come to me in the most unexpected places. How could I have imagined that I would end up thinking about the concept of this dessert while doing laps at the pool this past Friday. When my friend R. called to talk about the birthday party she was hosting on Saturday, she laughed when she added casually: “if you want to make something, that would be great“. Did I want to make something? I was feeling under the weather from working too many hours, but could I really let R. down on the day of her birthday party? Could I be this bad friend? I did not think so. I like R. and wanted something special for her day. After a quick mental scan of possible ideas, I remembered le fraisier that I never managed to bake the year before despite promising to, and thought about the massive amount of rhubarb I had purchased a few days before. A few more laps and I had my cake idea. Fraisier: derives from the French word fraise, strawberry. Le fraisier is a classic French cake made with a basic génoise (sponge cake) sliced in two halves, each of which is brushed with kirsch liqueur. 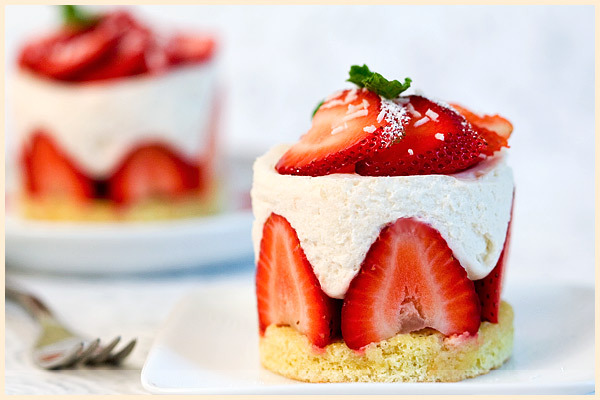 The cake is filled with butter cream and fresh strawberries, and topped with red almond paste or Italian meringue. Although at home we did not eat too many cakes that involved chantilly (whipped cream) or crème au beurre (butter cream) — my mum made a lot of tartes aux fruits (fruit tarts) instead — I have a particular attachment to this cake, especially when we would visit one of my grandmother’s. At mémé‘s, every single cake seemed to always taste better. Or was it because everything was allowed? Although the inspiration for this dessert is somewhat derived from the idea of a fraisier — with the génoise and strawberries — it largely differs from it since neither butter cream nor almond paste is used, the two of which I am not particularly fond of. Instead, I prefer to top the génoise and freshly sliced strawberries with a snow-light rhubarb mousse made with mascarpone, rhubarbe purée , egg whites and whipped cream. Now, I have to hope that R. liked it as much as I enjoyed licking my fingers when making it. Well, I can never go wrong with the classic strawberries and rhubarb combination. And guess what! I will be this boring. I just do not get tired of these two spring fruit together! And this will definitely be my Mousse Entry to the Donna Hay Event hosted by the lovely Helen from tempting-as-ever food blog Tartelette. And I know, I will mention it before you say anything. Outrage ! Horrible me! Mille excuses ! But it will come. I promise. Hopefully under a form that you will like even more. Je suis curieuse de connaître la suite. Tu nous auras fait bien patienter avec cette recette! 🙂 Mais, comme le dit le dicton, tout vient à point à qui sait attendre! Magnifiques photos. Les couleurs vives éveillent tous mes sens, c’est magique! it’s just wonderful, justement j pensais ce que j’allai faire de mes fraises! Vivement la suite! Cette photo est très évocatrice. De l’acide, du sucré, du mousseux, du plus consistant. Un florilège de saveurs et de consistances, sans lourdeur. 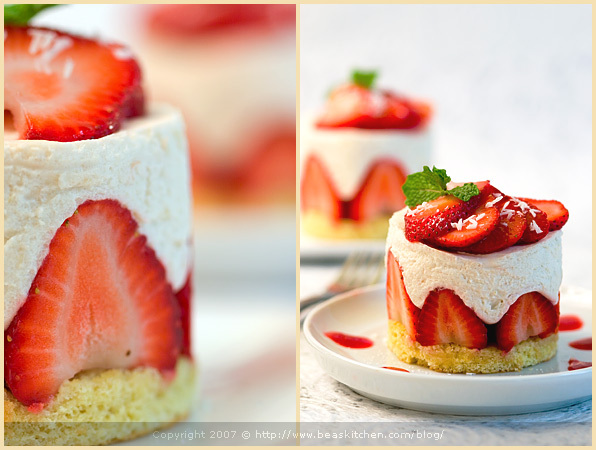 i’ve made the cream cheese strawberries cake right now~ so fun：） but i prefer yours~ so~~~o beautiful! Ce fraisier est superbe ! alors la si tu me prends par les sentiments…rubarbe et fraise..aie aie aie! Magnifique. J’espere que vous vous etes tous bien regale et quelle bonne copine tu fais! Magnifique réalisation et photos qui mettent vraiment l’eau à la bouche! Je suis toute en émoi devant tes sublimes photos et j’arrive à la fin du billet, il n’y a PAS de recette. Vite, la suite ! I love your blog!! You have beautiful photos and the recipes sound so delicious! I don’t know if you have posted before, but what kind of camera do you use? Also could you write a post on photography tips? Beautiful as always, Bea, You are indeed an amazing woman! Boring…never with strawberry and rhubarb…I mean red like that can never be boring. Love your photos. Waiting patiently for the recipe! Oh this looks as beautiful as at looks tasty. Too bad you didn’t have time to write down the recipe. Maybe you could just give us the mousse recipe, and we can find a genoise recipe somewhere else? comme d’ahbitude et comme toutes les autres recettes de ton site : sublimes, gourmandes, a dévorer d’urgence ! c’est irrésistile, je suis décidément fan ! j’avais très envie d’en faire aussi tu m’as grillée sur le fil !!! C’est trop trop trop appétissant ! Bea, c’est le plus joli fraisier qu’il m’ait été donné de voir !!! TRès beau et je raffole de l’association fraise/rhubarbe ! Je n’ai pas encore acheté de fraises cette année, mais les recettes qui fleurissent ici et là donnent drôlement envie. Et celle-ci si joliment photographiée, c’est le summum. Bea, this looks exquisite, can I come and live at your house? Those photos are absolutely stunning! Oh man, I can’t wait for you to post the recipe so I can give it a try! Oh my god! This is so amazing! Rhubarb rhubarb rhubarb – love it, beautiful!!!!! I love the color of these! Beautiful little cakes! I don’t like butter cream either, this rhubarb mousse is a much better partner! A perfect dessert – rich and flavorful, but light as air. Not too sweet, not too filling, but very very satisfying. The strawberries were naturally sweet, and the rhubarb added a touch of tartness without being overpowering, as it sometimes can be. And the presentation was celebratory. Thank you very much! I am lucky to have you as a friend, and not simply because you make such délices for me. Trop beau, trop beau. Vivement la suite. What a fabulous dessert! I love strawberries and rhubarb. And your pictures….oh my! Fantastic! Oh it’s so beautiful, Bea! And it makes me think that strawberry season will be here very soon. Even though we are still dealing with cold and … snow … I cannot believe it!!! Oooh, can they be anymore beautiful. I love that strawberries picture witht their stem off…very creative and cute! This makes me think of Charlotte!!! But even more beautiful!! I see now what you were talking about with my strawberry cake…your presentation is so much more spectacular..as usual. Can I come to yr house too? Absolutely stunning, Bea! I can’t wait for the recipe! Absolument fabuleuses ces photos… Les couleurs sont à tomber et le design, waouhhhh ! Vraiment vraiment très appétissant ! Oh bea- this is beautiful!This remarkable creation looks so tasty too. This food looks sooooo beautiful! Claude, eh oui tu le vois bien, moi et les fraises, ou les tartes aux fruits, c’est une vraie histoire d’amour! Helen, ah oui, je suis comme toi, je craque pour cette association aussi. Sophie, ahah, tu me fais sourire 😉 Patience. Patty, thank you very much for your kind note. My camera is a Canon 30D. This post idea is a great idea. I will have to do this, thanks for the suggestion. Carol, oh thanks so much. Astrid, I will make it even more special, I hope. Mimine, merci beaucoup de ton message. Mercotte, ah oui, c’est vrai. Je suis impatiente de le voir chez toi alors. Camille, oh dis-moi, tu es bien trop gentille. Je suis sûre que ton fraisier doit être superbe aussi, car je suis bien persuadée que tu en as déjà fait, pas vrai ? Beah, ah les fraises, que ferait-on sans elles ? Jennie, ahahh, you are funny! Ellie, thank you! Yes it will come! Promise. Bron, com’on, you surely can do very well too. I know that part! AH yes isn’t rhubarb the best fruit/vegetable, whatever it is! Eva, if you want individual cakes, which I think is cute, I would recommend the size I use, that is 2 3/4″diameter. They are good size. Check on jbprince.com, they have a real large selection. R., oh I am the lucky one to have you as my friend! And, I am so happy you liked them! Ivonne, ah yes, I am like you. I so much want Spring to come and settle now. Enough of this winter. Wet here today. Snow, ah yes, and I am a charlotte amateur too. Gives me ideas to make some soon again! Peabody, yes you can see that my love affair with these cakes is large, isn’t it? Perhaps because I was born in May! Oh yes Sally, I loved Keiko’s post! Patricia, thank you! It is not difficult and I am sure you could easily make them too! Gilly, thank you! It is “cooking”…. J., très contente que tu aies aimé. Mais dis-moi, tu parles français alors??? Veronica, ravie de te voir de retour, et que cela te plaise! Jeff, oh she cannot? Why?? Thanks everyone again for your generous comments! Ohhh… Thank you very much for this (Fantastic Fraisier). No matter how much calories it contains, i used to try it with mascarpone cheese as you mentioned, it is so tasty for sure i will follow it always. That looks just too delicious and too pretty 🙂 If such a thing is possibly because knowing you, you will easily top it with your next post! I have a question: after layering everything in the mold, how do you unmold it so neatly and cleanly? Great entry Bea. They look wonderful. Thanks for joining in at HHDD. no recette? oui béa, i’m outraged 🙂 i want to know how you unmoulded it so perfectly. magnifiques photos! Gorgeous, indeed!! I love it! This is just the most beautiful presentation of mousse ever. It is picture perfect. I don’t know anything about cooking with rhubarb – but your dish makes me want to learn! Thanks! I haven’t tried rhubarb since I was a kid, so clearly, I’ve got to try this. Gorgeous. I love strawberry and rhubard! Your pictures are gorgeous! Well done. Stunning presentation… and I love the creative combination of strawberries and mousse. Pl-eeease provide a recipe soon? er… combination of strawberries and rhubarb, even. This is so beautiful! Lovely. Am looking forward to a recipe when it comes – though I guess it might mean waiting for next year’s rhubarb season instead! I did try a version with a cheesecake style base, but the mousse on top just *wasn’t* quite right! wow, the pictures are just amazing! i keep checking back! where is that recipe? what kind of camera was it used to take these pictures? The pictures look just great! Is it at all possible for you to write this recipe down. I hunted all around (even on a visit in July to France) to find the mini spring form pans and have to my delight. I’m excited to try and do these. Do you also have recipes for doing salmon or other layered food in the mini spring form pans…. You are amazing and I’m so inspired by what you do!!!!! I bet you must be excited to have purchased these molds! Wonderful. Thanks for your very nice note! I have actually a recipe for salmon which I have to redo and post, so stay tuned 😉 As to this recipe, patience 😉 Sorry not yet ready! C’est vrai que l’association fraise-rhubarbe fonctionne toujours très bien. Ton fraisier est vraiment superbe, dommage que tu n’aies pas mis une recette pour la mousse légère à la rhubarbe (à moins que je l’ai loupée?). A force de surfer sur ton blog, ma liste de recettes ‘à tester’ rallonge à vue d’oeil! En tout cas, merci pour cette magnifique idée de fraisier revisité! Ah Botacook, non no, tu ne l’as pas loupee. Je ne l’ai pas encore publiee, malheureusement 😉 Jamais assez de temps pour tout faire ! Its June and where is this recipe? Rhubarb will be gone and I wont be able to try and make this. I think I will cry. Please post the recipe!! Sorry, I am just behind with posting recipes! I want the recipe for rhubarb mousse and strawberry cake. In your little springform pans I see a clear plastic film lining. What is this? Where can I get some? Pingback: Festa della Mamma: "The Day After!"